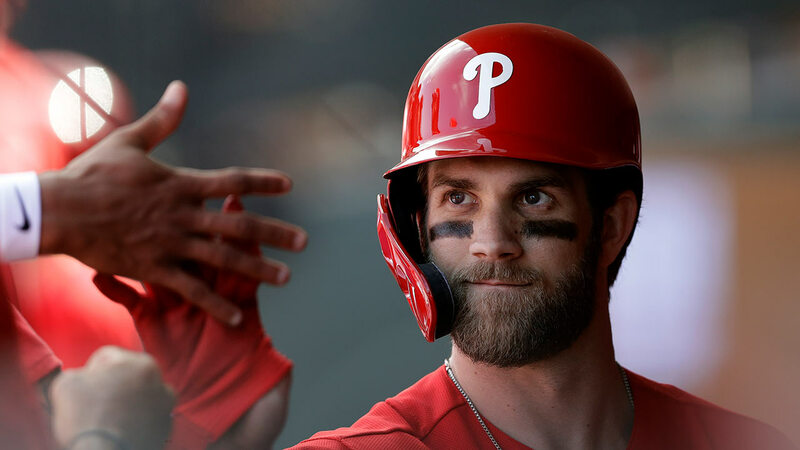 Philadelphia Phillies' Bryce Harper high-fives teammates during a spring training game against the Blue Jays, Saturday, March 9, 2019, in Clearwater, Fla. Better late than never for Bryce Harper. Four days before the end of the Philadelphia Phillies' spring training schedule, Harper hit his first two home runs for his new team. The first homer, a two-run shot, came in the bottom of the first inning, when Harper unloaded on a first-pitch fastball from Toronto Blue Jays righty Sam Gaviglio and sent a screaming line drive over the right field wall at Spectrum Field. The second home run came in the bottom of the sixth inning - and the ball left the park! A former MVP with the Washington Nationals, Harper signed a historic 13-year, $330 million free agent contract with Philadelphia on March 2. The 26-year-old slugger played in his first Grapefruit League game a week later on March 9, but didn't get his first hit until yesterday, when he recorded a single in two at-bats against the Detroit Tigers. Including his home run on Thursday, Harper is now 2-for-11 with six strikeouts and five walks. Prior to Thursday, Harper was 0-for-4 lifetime during the regular season against Gaviglio.